On Friday, Jan. 29, dental residents, faculty and staff of Wichita State University’s Advanced Education in General Dentistry (AEGD) program participated in the 15th annual Kansas Mission of Mercy (KMOM) dental clinic. Hosted by the Kansas Dental Charitable Foundation, KMOM is a charitable dental clinic providing free dental services to those in need. This year’s clinic was located in Topeka. Along with the AEGD participants, students from the dental hygiene program as well as the WSU Pre-Dental Student Association (PDSA) volunteered their services. 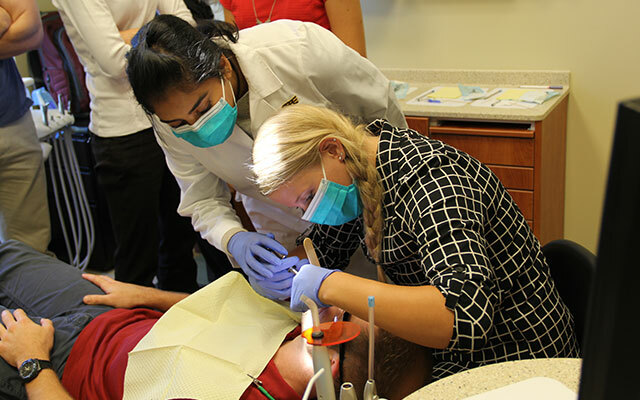 “Not only was it tremendously beneficial, as the residents worked primarily in oral surgery, but it was a great opportunity for them to better understand the desperate need for dental care, especially for those without financial means or insurance,” said David May, AEGD faculty member. On Friday, WSU residents, faculty and students assisted in treating 792 patients with $740,468 worth of donated services. In total, KMOM 2016 provided $1.2 million in donated service to 1,231 patients.